Offering you a complete choice of products which include coated woven fabrics. Our organization specializes in providing a wide range of Coated Woven Fabrics and Uncoated Woven Fabrics (Narrow Width) to our clients. These Woven PP Lightweight Fabrics are manufactured on world class circular looms and tapes are manufactured on world class tape lines. 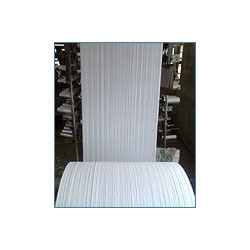 It is widely used for coating of circular woven fabrics and flat woven fabrics. Color white, natural or as per requirement. UV stabilization Yes if required. Packing rolls of 1000 to 5000 meter or as per customer requirements.